What is a dining room pool table combo? Urban living could, oftentimes, mean limited space. Giant furniture makers and manufacturers have seen this problem and came up with ingenious solutions like stackable chairs, folding beds, and, the latest innovation, the dining room pool table combo! What is it? 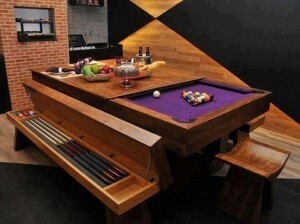 It’s actually a bright idea of integrating a billiard table and a dining table into one design. This design works perfectly with people who love a game of billiards (who doesn’t?) but do not have space for it. It also answers another need of any homeowner/tenant, which is to have a beautifully crafted dining room table. 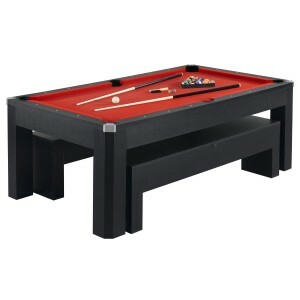 The pool table dining room table comes in different designs and colors. There are even ones made of good solid oak that will add a great statement to your dining room and amaze your guests when you whisk off the cover and present to them a pool table dining table conversion. What’s not to like in this dining billiard table? For the price of one, you get two pieces of beautifully crafted furniture – a dining table pool table combo designed to fit and blend wonderfully in your dining room. This sharp-looking dining billiard table includes 2 bench seats that are soft-padded and have easy to close and open tops thanks to the hydraulic EZ-lifters that are built-in. It also makes for great storage. A 2-piece reversible tennis top is the bonus accessory that comes with the purchase. The table measurements are: 32 inches high, 84 inches long, and 46 inches wide with corners done in chrome castings. The top rail is in melamine driftwood with lovely white inlays, about ½ an inch. Check the price on amazon. 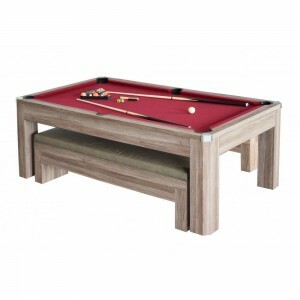 The dining room pool table combo by Ozone may be the centerpiece that will work beautifully for your dining room. They are made of solid wood and offer a lifetime warranty on every purchased billiard dining table. The dining billiard table comes in different designs, with names such as the Aragon 7 foot, in black and white and the Albany 7 foot Cherry Mahogany, the slightly more expensive one. Free shipping is included in the purchase offer for this European-designed pool table dining table combination with available matched bench seating. This is a full-size pool table and its playing surface is slate. The purchase also includes a Simonis Table Cloth. This is definitely a top of the range piece, so expect to pay more for the high quality craftsmanship, high-end materials and the luxury of this table. Check the prices on amazon. 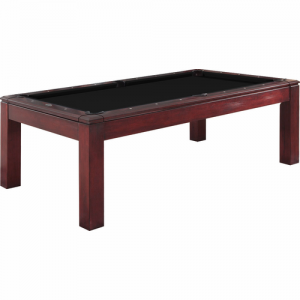 The dining table pool table combo from Hathaway measures 74.75 L x 36.75 W with a table thickness of ¾ inches with red felt. Matching table and bench are all in black and purchase price include free shipping, 2 table tennis paddles and balls, 2 pool cues, chalk net, 2-1/4-in pool balls, chalk, and a racking triangle. See amazon for a great discount! The table is not perfectly leveled which makes for an odd curve before ball rests. The felt in one of the pockets was not glued well and stuck out like a sore thumb which leaves me frustrated. I paid a hefty price for this table (around $1000 including taxes) and its many faults have made me see that this is not a great purchase. I can see the table giving me service for maybe a year though I have serious doubts about it. The table works beautifully for confined and limited spaces even if the price range is not to everyone’s budget. Its exclusive design brings out a ‘wow’ statement unique in a dining table pool table combo. When it is displayed in any showroom, it never fails to amaze people with its versatility and beautiful design. The table is perfectly made and designed for high-end apartments and corporate offices as it could even be disguised as a conference table. 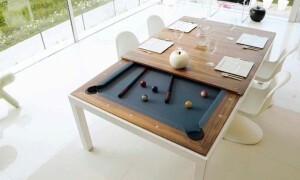 Because it is made from solid oak it makes a superb dining table and competition-sized pool table. The fully tensioned frame of the table makes it an excellent choice if the need is for a table that can look awesome, sturdy, and live up to its claim. It can also be made according to customer’s preference as the company is willing to give you swatches of wood samples for you to choose from. I am so thankful for the fantastic table that was created for us. It is just what I wanted to have. The table lived up to its claim as it was brilliantly done. It does not only play fantastic but looks great too! We are delighted with the table’s quality. It’s the best table I’ve played on with the wife happy with the beautifully crafted dining table. I originally ordered it for myself and was nervous about my wife’s reaction to it. I’m so glad she loved it as much as I do! This superb dining room, pool table combo is a must-buy for everyone who wants a modern design that looks great in any room. The accessories were completely accounted for and the pool sticks were fantastic. We are so impressed with our billiard dining table we even had our family name carved on it! We chose the black color and it looks pretty awesome, far better looking in actual appearance than in the pictures taken of it. If you already are a proud owner of a standard pool table and prefer not to buy another whole piece of furniture, getting a pool table cover is the right choice for you. The fitted covers are inserted into the pool table playing area, converting it to a normal flat top. The cover serves two purposes. 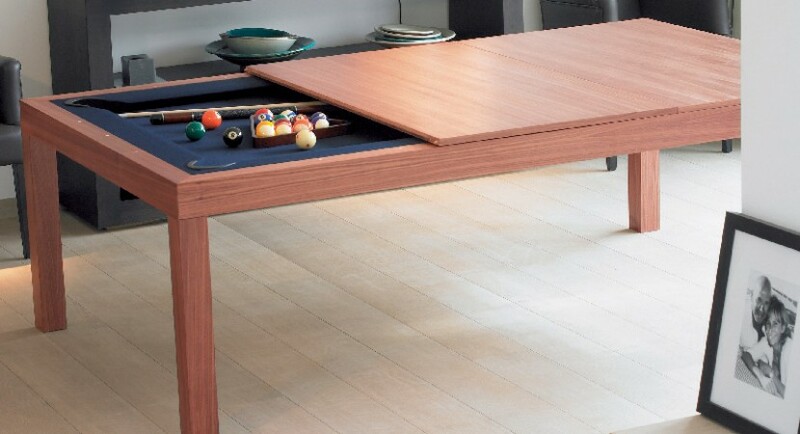 First, it allows you to use your pool table as a dining table or a conference table. Just cover it with a tablecloth and nobody will even guess that its a pool table. Having and using a pool table can also make you see the importance of guarding this beautiful investment from potential damages happening to it such as spills, dust, sunlight, sharp objects which are commonly found in every home. Again this need has been anticipated by furniture manufacturers who have seen the potential risk of harm done to the billiard dining table. Purchasing a billiard or pool table does not come cheap and the best thing we can do is to protect it from harm. Here are some pool table covers that do not only protect your precious pool table and covert it into a dining table; they are designed to enhance and complement the room’s décor with the use of color, fabric, and design options. This pool table dining table cover measures 39 x 78 inches, made to fit 7 foot tables. The company does make other sizes, too. The conversion top folds up quickly making it easy to store and the purchase includes free shipping. In order to get a good fit for your billiard dining table, measure its inside dimensions. Get it on amazon. 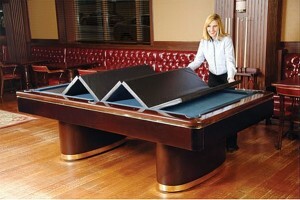 A more budget option is a simple drape-over cover for a pool table. The drawback is that you won’t have a flat surface, the playing area is still sunken in. It does, however protect the table from any damage or spills. Made of heavy duty vinyl with cotton backing, the cover measures 115.5” L x 71” W for an 8 foot table. Other sizes available too. It’s also available in several colors to suit anyone’s style and design concept. The price is much lower than the inserts, see it on amazon. God of Pool Copyright © 2019.